The ride was a fast 90 miles in two and a half hours in blazing heat. Past fields of crops and old stone houses and small towns with folksy stores, over rolling hills and roiling river, around swooping curves that follow the hills, under baking sun and cooling shade of wooded lanes rode me and Bobby De Fazio on his 2003 Road King Classic with just 6 miles on it. Brand new. The gorgeous bike blew through Hunterdon County like a magic carpet under Bobby's control, chuffing like a happy tiger. Leaving at noon, it feels great to be on a motorcycle. From 22 East, we head through Lebanon, a small, honest, working town. We turn right onto Cherry Road that runs up alongside Round Valley Reservoir, where the big stretch of water, sky and hills are all the same color blue on one side, and sculpted farm fields swirl on the other. Down the open road of Route 629 past Stanton, through woods and winding twisting farm fields we zip. The ride through Hunterdon County (map) surprises me with purple hills in the distance, valleys between. At the junction of 523, left goes to Whitehouse Station and we turn right towards Flemington, destination...unknown. Bobby goes where the road takes him, and in Hunterdon County it's easy to follow the landscape and ride for hours in serenity. Bobby practices the art of what he calls "throttle therapy," and boy, do I understand! 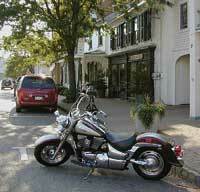 We cross the creek into Raritan Township and the Road King is moving smoothly as this touring bike is meant to do. Up 617, we fly through Cherryville, a lovely country town with a steeple church. 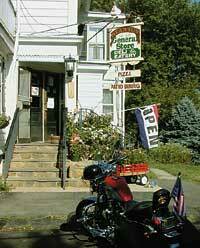 Unknown by most, Cherryville is special to motorcyclists who see everything up-close on their rides. Riding today in 100 degrees, it feels like a sweltering day at the beach, as if I were sitting on the edge of land with the soothing ocean breeze on my face. The great sound of the bike and the feel of the wind, the zoom of the landscape all swirl around me. At 513, right goes to Clinton, but we go left toward Pittstown. The feel of the bike's ride reminds me of the comforting light chop in jets streaking through the sky at 30,000 feet on cloud cushions. The comfort of this motorcycle is so complete that I could almost fall asleep, but I'm having too much fun! The green farms stay with the road through Pittstown. We've passed no traffic lights and only a couple stop signs. 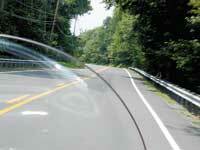 The road is wide open and yes, you can motorcycle sweetly in Central Jersey, in Hunterdon to be exact. Quakertown is nearby, and we're heading right towards...somewhere. Does it matter? Not as long as the road is long and the motorcycle rolls. The scenery is as pretty as anywhere--fluffy white pines along white post and rail fence, green pastures and spruced up farmhouses and barns with orchards. It's a postcard everywhere--rolling road and country nursery along the slopes of undulating hills. Past Alexandria airport, hay fields, hot crops in the sun, white scallop fence, wide open fields, woods, farms of multi-colored hues ...coming into Frenchtown. 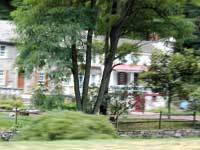 Putting down the hill onto Race Street, then left onto Trenton Avenue towards Lambertville along the Delaware River. If the mood strikes, pull over and stretch your legs on the Delaware & Raritan Canal State Park towpath. I can smell and feel the change in air here. Dark woods along the left and river on the right make it feel a little cooler. Bobby says the road is endless and it looks like we're riding right into a mountain that moves as we get closer. The curve comes easy and we glide on by. Old homes on the left are tucked in the trees, some beneath towering cliffs. How does Bobby feel? "Relaxed and calm...and ready to deal with anything with a clearer head." We pass the sign to the pedestrian bridge ­ another great place if you want to stop. The skinny bridge shoots over the river to Lumberville, and memories well of a boy I once knew who leaped into the river here for fun. We cross the river in Stockton, home of the "small hotel with a wishing well." Dilly's Corner tempts us in PA, but we don't stop. Turn left and you go into New Hope, but we press on north up the Delaware. We're in the woods now. They cover River Road with shade and it's really cool, and most times the river is in view. The PA side is narrow, winding and beautiful. We pass through the village of Lumberville where every old home is gorgeous. Now the woods smell mossy. 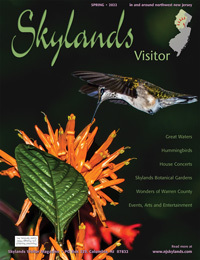 "Delaware River Scenic Drive ­ next two miles" the sign says. At the T, we turn right onto 32 North and ride between the canal and river for a while, then stop in Point Pleasant at the Village Store for a cool drink in air-conditioning. I'm drinking icy water and the hair stands straight out from my arms, tingling. I feel it moving, a new sensation. This looks like a good stop for a bite to eat--sandwiches, a grill, ice-cream and home-made sweets, and you can sit down inside or out at a table. Back on the road, north out of Point Pleasant, 54 miles so far. We pass through a small town with beautiful homes, a boy scout camp, tubers on the river, and at Uhlerstown Road we cross back into Jersey where someone plays in the river, next to an American flag. Through Frenchtown we go back up the hill to the left, picking up speed, moving. With every shift, the bike roars. To the left as we head north, I can see the hills of the Highlands far away. We're riding a smaller ridge. It's hotter back in Jersey, on the wide-open roads. It's farmland here instead of woods. Bobby notices the different sensations--fragrance of the land, the feel on skin, temperature. Sometimes I feel a slight drop in temperature, and Bobby looks up to see the sun behind the clouds. We make a left onto 625 North back towards Alexandria, cross a road and continue to Clinton the back way and somewhere go on Rubble Road. I'm lost now and don't care where we are. At some place and time, we parallel 78 on a thin country road with fields and a few houses and enter Clinton on Main Street. We take 78 for an exit to the Round Valley Access Road to go back to the store, I'm told. All I know is I want a Harley Sportster. Bobby says he's seen more women riders with their own motorcycles lately. In my little truck going home, I feel more mellow than I have felt in a couple years and GOOD as if I've had a happy drug, as Bobby calls it--"throttle therapy." He's right. Bobby Di Fazio's been riding for 30 years, ever since he hopped on a Sportster at 16 on Long Island, where he rode the flat roads to the Hamptons and Montauk Point. His grandfather had an old knucklehead, but it was his buddy, Mike, who loved motorcycling, who got him started. He has three motorcycles at the moment ­ a V-rod (Harley's newest cycle built with Porsche), a soft-tail, and a Road King.